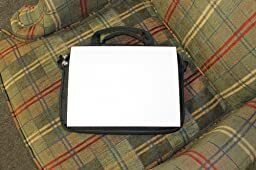 "This Best Selling Case Logic AUA-311 11.6-Inch Laptop/Chromebook and iPad Slim Case (Black) Tends to SELL OUT VERY FAST! If this is a MUST HAVE product, be sure to Order Now at Amazon.com to avoid disappointment!" What customers say about Case Logic AUA-311 11.6-Inch Laptop/Chromebook and iPad Slim Case (Black)? How wonderful to be able to review a product you are genuinely excited about! The Case Logic 11-Inch Slim Case looks great and will serve my need to transport my 11″ Macbook Air and charger to and from the office. * It’s small. You won’t be able to carry a lot of extras but this is exactly what I wanted. * It does come with a strap. Nylon webbed, with big plastic hooks and a rubber, non-slip pad. Be aware that anything larger than the 11″ Macbook Air won’t fit. It’s snug. The case doesn’t open up all the way and fold out like a suitcase. It’s more of a sleeve (slide in from the top) model. I published three photos, so take a look at those too. I recently bought the Samsung Chromebook (Wi-Fi, 11.6-Inch), mostly because I was curious about this new genre that had come out of nowhere (well, Google Labs) to become Amazon’s best-selling laptop. I love it, and it’s almost completely replaced my MacBook Air as the machine I carry with me when I leave the house. 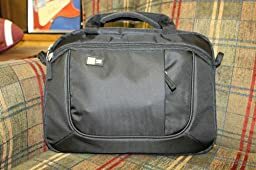 But the bags I had for the 13¨ MBA were a little too roomy, and I went looking for something more suited to the Chromebook’s diminutive size. This Case Logic bag is perfect!. The Chromebook fits snugly, with room on either side for a Nexus 7 and a small notepad, and with a couple of compartments on the outside that are perfectly sized to hold a power supply (although I don’t usually take that, because the Chromebook has such a great battery life), a Bluetooth mouse, a pair of earbud headphones, a couple of pens, business cards, and a Smartcard, with room left over. I really like the fact that the case has a handle — I don’t like sleeves as stand-alone cases — and that it comes with a shoulder strap for jaunts when I anticipate having my hands full with other stuff (another reviewer said that the shoulder strap was an added-cost option; mine came with the strap). All my experience with Case Logic quality and durability has been excellent, and this looks like it lives up to their high standards. And it’s incredibly light, adding almost nothing to the weight of what you put into it. The only thing that puzzles me is the strap along the back side of the case; I just don’t see what I’d use it for, and I think another pocket would have been more useful. The build quality is what I expect from Case Logic. I do not foresee the nylon wearing out before I would retire it. The shoulder strap is decently long considering the size of the case, which I also like. 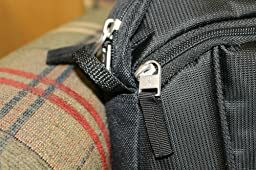 Note that the strap snaps are plastic and not metal, but the weight this case will be carrying is light enough that this fact shouldn’t be an issue. I actually purchased this case for a Microsoft Surface Pro. The measurements looked like it would fit it and it is a perfect fit. There’s enough room still on the sides for the Surface to move a little bit, such that a mistaken tap on a door or wall will not alarm you one bit. The 2 pockets will not perfectly fit 8.5×11 paper – the corners will hit the zipper. If you are fine with rolling the paper around your device in the middle or folding, then that isn’t a problem. I was able to fit the Surface charger, a bluetooth headset with it’s associated charger, and a small USB hub in the accessory pouch. There is still more room in there if I wanted to carry maybe a small bluetooth mouse as well, but it may bulge the pouch out a little(there is a bit of stretch in the nylon so that should be fine too). Overall, I am very happy with this case. For the price and functionality, I see very little to complain about.